5:00 AM. Saturday morning. The sun is out for the first time in months and my bedroom is too bright. The birds are shrill. I’m pretty sure it wasn’t the sun or the birds though. I’m awake. Nobody else in my house is. I’m awake because I. Am. Starving. I look over at Martin who is snoring softly. To my ear, incessantly. I think I might be able to go back to sleep, despite my growling stomach if only…I give him a quick kick. Just a little one. A stage whisper – You’re snoring! Roll over! He snorts and flips over muttering. I look at the clock. 5:07. Ugh. Too early to get up. I could sneak down to the living room with a book but I don’t. I’m too hungry. I nudge him with my elbow and whisper – Hey, are you awake?! – He sighs then groans. – Wha?! Wha’s wrong?! – I try to smile winningly at his closed eyes, hoping he’s peeking but he is totally fast asleep and me smiling isn’t helping at all. Maybe I can hold out a little longer. 6:15 AM. I think this might be when the timer on our coffee maker starts the drip and the scent of coffee should start wafting up the stairs at any moment. The coffee could be ready in less than 5 minutes! I toss dramatically and sigh, yanking the covers in my direction. One of Martin’s eyes pops open. He stares at me blearily and then his eyes drift shut again. I think he read my mind. – The coffee doesn’t start until 6:45 on the weekends. So don’t look at me like that. – If he could roll his eyes he would, but his eyes are closed. I have to plead. – Oh please, I’m starving!– and I try smiling winningly again. No dice. I think he can probably feel the intense beam of my gaze against his eyelids. – Sarah. My legs aren’t working yet, I can’t even move my arms. I am not ready to get up. You’ll have to make the coffee if you want it this early. I am so desperately hungry though. Too hungry to make coffee. Too hungry to make toast. So I beg. He caves. Thank goodness! Ten minutes later Martin returns, shaking his head, rolling his eyes, but he is carrying a tray. A steaming bowl of a latte scented with nutmeg and cinnamon, a tiny but excellent sandwich, sharp Italian cheese, bitter marmalade and butter – on this special bread Martin makes for Siri. It has spelt flour in it, and dried apricots and hazelnuts. This is such a marvelous breakfast. Especially if you have been over-zealously detoxing the previous day. Blame my irrational behavior on extreme hunger please. There is no other explanation. And then, if you are taking the month off from any kind of crap bread, sugar, red meat and are finding yourself starving at inconvenient times, check out the following recipe. My cousin gave it to me. It is perfect for a healthy afternoon pick-me-up. I made it for a cocktail party this weekend and then immediately made another batch for me. Lima beans have a bad rap so don’t let them put you off. 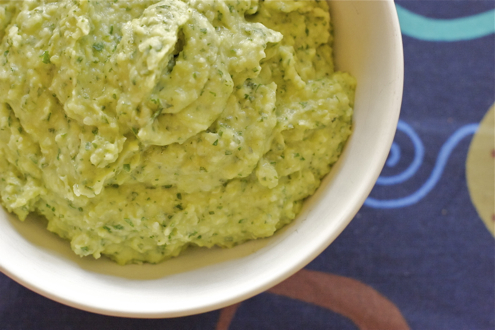 Lima Bean Pate is an herbaceous and lemony, gorgeously green spread for little crostini (for the kids, as almost no bread is delicious enough for Delicious Detox) or for crisp vegetable delivery devices – like celery, red and orange pepper or cucumber. 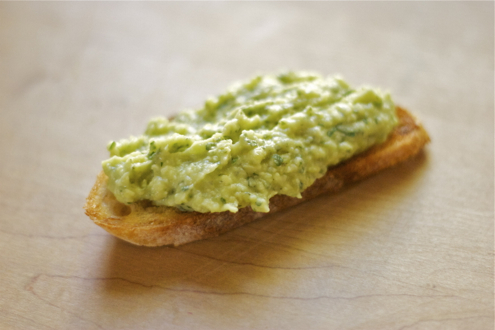 Lima Bean Pate can be ready in about 20 minutes – 15 of which is hands off. It is the perfect afternoon snack. Very nice. In a small saucepan, bring the water and 2 teaspoons salt to a boil over high heat. Add the lima beans and let boil until just tender, about 12 minutes. Drain in a colander and rinse under cold running water for about 2 minutes to cool. Shake the colander several times to drain as much water from the beans as possible. Place the beans and the remaining ingredients in the bowl of a food processor and process to a smooth, thick puree, about three 30-second-long pulses. Between pulses, push any of the mixture that clings to the side of the processor toward the blade with a rubber spatula before pulsing again. Season the pate to taste with salt and pepper and transfer it from the processor to a small bowl or plastic container. Cover tightly, and store in the refrigerator until ready to use, not more than 3 days. Sometimes this magical thing happens in my kitchen, where I have all of the ingredients, even some that are fairly obscure, and I can make something really delicious on the spur of the moment. I love it when that happens. Since Plenty, what I’ve been in the mood for is vegetables, and this blog I follow, Dana Treat, has tons of ideas for seasonal delicious vegetable food. (Notice that I didn’t say vegetarian? I really am not a vegetarian.) Still, maybe because of the holiday gluttony, vegetarian, even vegan food is what I crave. So I was very happy to discover this soup last week. It’s one I’ve eyed and abandoned in the Deborah Madison Vegetarian Cooking for Everyone for years. For some reason, I think because Ms. Madison described the soup as “thin”, it didn’t sound so delicious. Then I saw the photograph on Dana Treat, and I was turned. This is a fabulous soup. Also, it is very easy to make, which proved to be very handy when I was housebound with four kids for three days last week. So often jilted by the weatherman predicting snow, I refused to believe what the weather reports were saying. Surprise, surprise! Wednesday morning we were totally snowed in, a rare thing in Seattle. I couldn’t get the car out of the driveway. I was afraid to even try. I was kind of desperate to come up with a dinner for four hungry kids using only what I had in the cupboard. Scanning the recipe for Red Lentil Soup with Lime; was it possible I had what I needed?! I peered into my pantry. Wow. I had two cups of red lentils! I had basmati rice! Turmeric and cumin – I always have those! When I found some only barely wilted cilantro in the crisper and a couple of limes, there were clearly beautiful possibilities for dinner. (Although I feel I must mention that my brave and kind friend Mary Alice went out into the cold to bring us a gallon of milk, orange juice and—because I’m shameless—some fresh spinach for this soup! She trekked through the snow and ice with a backpack and Yaktrax (so cool!) on her boots for us!) Technically I suppose we could have skipped the spinach, but when you’re snowed in you get anxious for something green. As always, and even though there is rice, I think this is lovely with homemade croutons. Only five extra minutes! Put the lentils, turmeric, 1 tbsp of butter, and 1 tbsp sea salt with 2 1/2 quarts of water in a 7 qt. heavy sauce pan or dutch oven. Over medium high heat, bring to a boil, then lower the heat and simmer for 20 minutes. The lentils should be very soft and nearly falling apart. Using an immersion blender, pureé until very smooth. While the soup simmers, in a large heavy sauté pan, cook the onion in 2 tablespoons of butter, with the cumin and the mustard seeds, over low heat. When the onions are very soft, after about 15 minutes, add the cilantro and cook for one more minute. Add the onion mixture to the soup and the juice of two limes. Taste to see if you would like more lime juice. This soup tastes very good a little sour. Add a generous spoonful of warm rice to each bowl. Ladle soup over the spinach and rice. Garnish with a dollop of yogurt. While the soup is simmering and the onions are sweating in butter, you could make the croutons. They are not required but I totally love them with this soup. I happened to have a very stale ciabatta on the counter during the snow week and I hacked off slices all week long. I put croutons under poached eggs, with cheese and salami and with this soup. It really doesn’t matter if the bread is very stale. The croutons should be glossy with butter and olive oil and so crisp they shatter as you bite down. I would cook the croutons first, and then wilt the spinach, in the same pan. Heat the butter and oil over medium high heat. Sauté sliced bread until golden, then flip. 1-2 minutes per side. There is something about this soup, or maybe there are a few things. First of all, the color is ravishing, a pure saturated yellow, flecked with bright green cilantro. The scent of melting onions and the toasted aroma of mustard seeds were the perfect antidote to a cold wintery night. And then of course there was the cool, creamy, yogurt, in counterpoint to the richly flavored soup. We all loved it. More cannellini beans. More soup with bread stirred into it. What can I say? I imagine it will be difficult to convince anyone that they ought to run out and try this soup. I was dubious too, the first time I tried it. I don’t think it’s just the memory of the candlelit barrel vaulted brick ceiling in the restaurant or of being an architecture student in Florence or of walking out in the chilly darkened narrow streets of late fall behind the basilica of Santo Spirito. That memory is sketchy and faded and would be unlikely to have any bearing on how I remember this soup. It was over 20 years ago after all. I do remember the cistern quality of the room, the dim light, the heavy dark wooden furniture. Also that it was kind of thrilling to enter a space that was so deep underground. A dozen of us crowded around a long corner table. 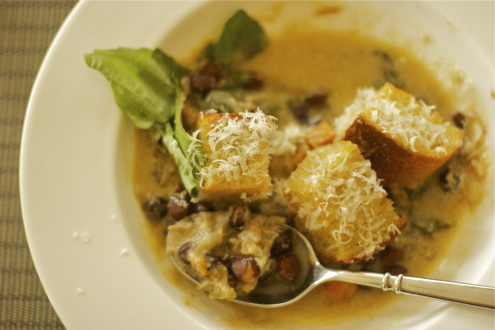 We’d been strongly encouraged to try the ribollita. Yes, skip tagliatelle al cinghiale e porcini. Skip bistecca alla fiorentina. (It’s way out of your meager student budget anyway.) Don’t just order a salad or pasta. So I, like everyone else at the table except for one extremely picky person, shrugged and ordered ribollita. I am still so happy I did. Ribollita is not a brothy soup. It looks like wet stuffing. (I shouldn’t have written that. Now you’ll never try it.) There are ragged shreds of cavolo nero run all through it – it wouldn’t be ribollita without the cavolo nero. Don’t think you can just substitute plain old kale or cabbage and still call it ribollita. Bread is essential. I have come across recipes that layer the bread in the soup like some kind of bread lasagna. This seems wrong to me. It needs tearing up and stirring in; transforming plain old minestrone into a deliciously rich velvet mess. A drip or two of green olive oil over the top, just before serving – that’s also important. Ribollita is the easiest thing in the world to make and at the same time, time consuming. To extract rich flavor from such simple ingredients, you have to let it cook for awhile but the hands on part is minimal. You will be richly rewarded for a little planning and labor! I think I might be begging you to try this…No, I am begging you to try this. You won’t regret it. 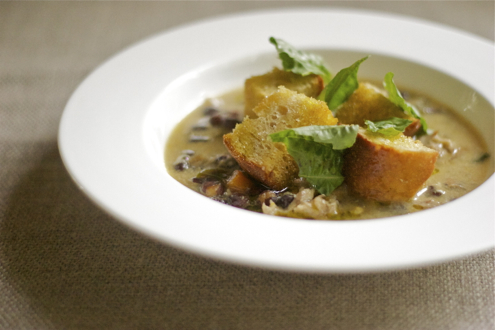 Ribollita is just the thing for December. Utterly warming and deeply satisfying on an almost spiritual level for adults. And yet my four year old plowed through a large bowl. Even after burning his tongue, he kept on eating. Then he asked for seconds. Over medium heat, in a large heavy soup pot, place the parsley, garlic, celery, carrot, onion and olive oil and stir. When the vegetables are hot and gently sizzling, turn the heat down to low and cover. Leave for about 30 minutes, stirring occasionally. Do not let it stick or brown. Add the tomatoes, and cook for another 30 minutes in the same way. Add the cavolo nero and half the cannellini beans with enough of their cooking liquid to cover everything and make the soup liquid. Simmer for another 30 minutes. Using an immersion blender if you have one or a food processor if you don’t, puree the remaining cannellini beans. Add them to the soup. If the soup looks dry, add a little boiling water until it is just liquid. Add the bread, several glugs of extra virgin olive oil, and season to taste with sea salt and pepper. The soup should be extremely thick. Garnish each serving with more olive oil at the table and parmesan if desired. Even though it stresses me out a little bit, I have to say I love that quote. Many times it has been running through my head and gotten me off the couch and into the kitchen with a few leftover chicken carcasses, a couple of pounds of chicken wings and a pile of onion, carrot, celery and parsley stems. Ms. Hazan seems to have little patience for slackers. Homemade chicken stock is not hard to make anyway and as I’ve said before, life is too short to rely on boxed chicken stock. Even the organic kind is really a lab concoction and shouldn’t be used in any soup where the broth is the star. What you need for this soup is homemade stock. Chicken broth is so popular in my house that every year when I ask my 9 year old what he wants for his birthday he has a quick single word answer: “Broth.” Instead I make this soup which is broth-y but not quite as uncelebratory as a plain bowl of chicken broth. I guess some people might say a simple bowl of white beans, chicken broth, parsley and garlic isn’t party food at all. If you got off the couch and started making your own broth, I think you might be singing a different tune. Anyway, this post is not about broth because I already covered it months ago. This post is about White Bean Soup, which is a lot easier than the kale and fennel version I also love. If my kids beg me to make anything, they beg for “white bean soup – with extra broth! Can you make it with extra broth please? !” and I make it if and only if we have chicken broth in the freezer. Last night I used my last 3 bags which Martin had to wrench off the freezer floor – I guess I haven’t made broth since early spring. Clearly I’m going to have to get off the couch and dust off my stock pot. The night before you want to make the soup, put the dried beans in a large bowl and cover with 2-3 inches of water. In the morning, drain the beans and put them in a large pot covered with 2 inches of water. Add the bay leaves, the peppercorns (in a tea ball if you have one – it makes it a lot easier to fish them out), and the 2 crushed garlic cloves. Bring the pot to a boil and then turn it down quickly to maintain a gentle simmer. Leave the pot partially covered. Simmer for 45 minutes and add salt to taste. I would add about 1 teaspoon. When the beans are tender, turn off the stove and leave them until you are ready to make the soup. This could be a lot later in the day – the beans will be fine just sitting there. Heat 1/2 c. olive oil in a large heavy soup pot. (I use a 7 qt. Le Creuset) Add the chopped garlic and over medium heat, cook the garlic until it is pale gold. Drain the beans and add them to the pot. Grind in some pepper and a pinch of salt, then stir and cover. Turn down the heat and wait 5 minutes. Add the 6 cups of stock and turn up the heat until the soup in simmering. Simmer for 5-6 minutes and add the parsley. Stir and serve hot with olive oil, grated parmesan and the croutons floating on top. In a 10″ or larger heavy skillet, heat the butter and olive oil over medium heat. As the butter melts, slice 12 thin slices from the baguette. When the butter is no longer actively foaming, add the sliced baguette in one layer to the pan. Check the bottom of the bread after one minute (it’s so sad if the bread burns!) but it will probably take 2-3 minutes total until the bottom is deeply golden and crisp. Flip the bread and toast the other side, equally carefully. I would make extra croutons for sure. I hope you’re feeling smug. You have stock in the fridge and the freezer now. Now the soup will be a snap. One thing about making stock is that it slips so easily into the rest of the day – especially if you’re fearless about leaving the barely bubbling pot on low heat and getting on with other things. Although I like all the small building blocks – slicing an onion is an exercise in thoughtful efficiency, smashing every clove in a head of garlic can be cathartic. The scent of fennel seeds crushed under a pestle – and I’m in Italy. There is nothing monumental about any of these tasks but the result is there simmering on the stove. If all you ever do is open a box of stock, all you get is that funky boxy chicken smell. The work on Day Two is minor. You set the beans to soak late in the day after the dishes are done, your kids are asleep and you are about to open a good book. At least that is what happens to me every single time. I get into bed at about 11:30 PM with my book, something I’ve been dying to read all day, and then suddenly I remember, I have to soak the beans! So I haul myself out of a warm bed, through the cold house, and downstairs to dump 1 1/2 cups of cannellini beans in the biggest Pyrex bowl and cover them generously with water. Then I go back to my book. That’s the end of Day Two. See what I mean? A four year old could do it – if he could stay up that late. In the morning, it’s good to start before anyone else is awake. Outside is still darkly grey, but I flick on the light and the kitchen glows like a lantern. Drain the beans and put them in a large pot. Then cover them with 2 inches of water. Add a few smashed cloves of garlic. 24 peppercorns (don’t ask me why 24 – I read it in some recipe somewhere a long time ago and it just stuck) and bay in a large mesh ball. Start the pot to boil. When it does, lower the heat and leave to slowly simmer. I make a cup of coffee and go with my mug back to bed. I can laze around with my book for around 45 minutes then it’s probably time to turn off the stove. Taste a bean and see if it is soft – not mushy though – and nearly ready to eat. Now it is time to salt – if you salt at the beginning, the skins will be tough. Add salt to the water until it is quite salty – at least 2 tbsp. Turn off the heat. Let the beans sit there in the cooking liquid until you’re ready for them. For me this could take at least until lunchtime. Ok – the rest is quick. Check it out: Chop the onion. See how I sliced the onion in half from top to bottom, then made long parallel cuts toward the root. After that it is very simple to slice thin perpendicular cuts to get perfect small dice. Cutting an onion this way is much faster than randomly chopping into tiny pieces. Trim and core the fennel, slice into 1/4″ slices – they should look like long quarter moons. Wash and remove the ribs of the kale. Slice into ribbons. Take a large heavy bottomed soup pot (I use a 7 1/2 qt. enameled cast iron) and heat over medium heat. Add 1/3 c. olive oil, the chopped onion and 1 tsp. chili flakes. Stir thoroughly and lower heat. Cover. Simmer for 10 minutes stirring occasionally. Add the carrots and celery. Raise the heat to medium-high. Stir and cook with the lid off for 5 minutes. Add the chopped garlic , ground fennel and sliced fennel. Cook for two minutes. Add the tomato. Cook for 2 minutes. Taste for salt and pepper. If you decided not to salt the stock, be sure that the vegetables are salted until they taste deliciously but not too salty. Add the beans, then stock. Bring the soup to a simmer. Cook for 15 minutes. Add lemon juice to taste and taste again for salt and pepper. I like the lemon subtle. The juice from one small lemon should be plenty – this is not lemon soup. While the soup simmers, bring a medium pot of water to the boil. Add a tbsp of salt and blanch the kale for 3 minutes. Drain and rinse with cold water. If I were you, here’s what I’d do. (I am always guilty of overselling – sigh. I do hope you like this!) If you have one, set a wide soup plate on the counter. Pour a glass of wine and leave it on the table where you plan to eat so that the flavors open up. Toast a piece of rustic bread by brushing it with olive oil and running it under the broiler. Don’t burn it and do toast both sides – it should be golden and crisp on the outside and almost creamy inside. Peel a clove of garlic and cut it in half. Rub the cut half over one side of the toast and put it in the soup plate. A handful of blanched kale goes on the toast. Ladle soup over toast and kale until the bowl is brimming. Drizzle a tablespoon of pungent green olive oil over the top and grate parmesan cheese lightly over all of it. Take the soup plate and go sit with the glass of wine. Take a deep breath – the fennel and garlic are the most forward. Then the warm scent of chicken stock. Pale and yielding cannellini beans contrast with deep green chewy kale. Something about the toast pushes me over the edge. Taste it. White Bean and Kale Soup is grown-up and sophisticated yet so mild and comforting it could be child’s food. Finally. A soup for my sister. Lisa – this soup is for you. Our family has had many memorable meals from Marcella Hazan’s Essentials of Classic Italian Cooking . Her Bolognese, her pesto, La Grande Insalata Mista, cannelloni, fresh pasta, focaccia, the Roast Chicken with Lemons. All memorable, all standbys. Although it has been a couple of years since Chick Pea Soup has been in rotation, I bet I have made this soup over 100 times. How should I describe it? For a grown-up, this soup can be rustic Italian; for a kid, it’s an easy going pasta and beans; for a baby this soup could be food, could be a toy, and it’s definitely great for practicing small motor skills. I made Chick Pea Soup today but what I initially wanted to make was Alice Water’s Pasta e Fagioli – the one I wrote about in my very first blog post. I love that soup but you have to soak the beans in advance. I can never bring myself to use canned cannellini. Canned cannellini are too mushy and they don’t deserve to go in Alice Waters’ soup. Canned garbanzo beans are another story. Although I usually like to soak and cook my own, today was a very busy day and I had to take short cuts. When I realized at 2 pm that I’d forgotten about soaking cannellini or cranberry beans and that I hadn’t any more time to go to the market, I knew it was time. Time to make the soup that was probably the initial inspiration for this blog. This soup is the reason that I always keep cans of chick peas, boxes of Pacific brand organic chicken stock and canned tomatoes in the house. I have slightly adjusted the quantities of the soup so that there will be no leftovers from the cans. Two cans of chick peas, one quart box of chicken stock, a large can of tomatoes, half a pound of pasta. Done. We had a whatever-is-left-in-the-crisper salad and Boursin and crackers on the side. I was going to write that this meal was not my proudest moment but I think I’m going to have to take that thought back. 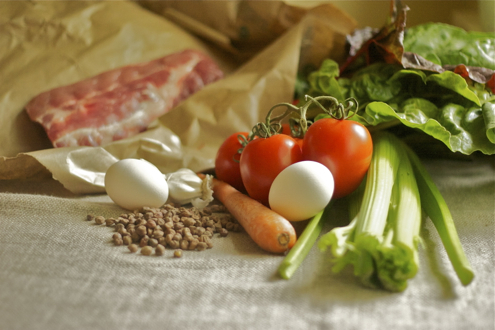 Making a meal that satisfies every person in the family, without a special trip to the grocery store, using just what’s on hand, is something to be very proud of. Soup is one of the tastiest things one can do with chick peas. Put the olive oil and garlic cloves into a 5-6 quart heavy bottomed soup pot and turn on the heat to medium. Sauté the garlic until it becomes light brown all over and then remove them from the pot (you can toss the garlic out). Add the rosemary sprig (or dried rosemary if that’s all you’ve got) and immediately add the tomatoes. They will sizzle wildly for a few minutes. I stand as far back as I can with an apron on and my kitchen scissors in hand and quickly snip all the whole tomatoes into 3/4″ pieces. A normal person would just get out the cutting board and chop them up beforehand. If you value your shirts and your hands, I recommend that you do this. Cook for 20-30 minutes over medium low heat. You’ll be ready to continue when the oil floats free of the tomatoes. Add the drained chickpeas and stir thoroughly. Simmer for 5 minutes. Add the pasta, and stir every few minutes, following the cooking time stated on the box. Stirring frequently will keep the pasta from sticking to the pot. Cooking pasta this way is very different from cooking it in copious amounts of salted water. Season with salt and pepper and serve with freshly grated parmesan. According to Mr. Fearnley-Whittingstall, “This soup is a brilliant standby if you need to produce a quick meal from store cupboard ingredients”. I took that as a challenge – mostly because the soup has caraway seeds in it and I almost never like food with caraway seeds. Lentil soup with caraway and minted yogurt. I also find it suspect when an ingredient is given “ed” status. Minted yogurt indeed. Hmph. You must be wondering why, given the starring role for caraway and the silly “minted name”, I would have ever decided to try this soup. Especially given that it was Crazy Thursday and I usually try to stick with a sure thing that the kids will like because they’re so tired after all the activities they have that day. Also there are so many recipes in River Cottage Everyday that I am really truly excited about. What it came down to was that I had all the ingredients. Even the fresh mint for the yogurt I had from the lamb the night before. I also had half a loaf of great bread in the freezer and the Fleur d’Aunis from the tartiflette for a grilled cheese sandwich to accompany. The instructions for the soup seemed really easy and I could see it would be a cinch to put together. So I went down the caraway path. Guess what?! The soup was wonderful and not only because it was so easy. Now I’m curious if the reason I don’t really like caraway is because in most recipes the seeds are included whole and that makes them more pungent. Not to mention that their hard chewiness is distracting. In this recipe the caraway seeds are toasted and ground. Their earthy herbaceousness contrasts with the coriander – which is sprightly and citrus-y. Since the soup is pureed, the lentils add smooth vegetal body combined with all the onion and some carrot. It’s actually quite marvelous, the way it comes together. And I have to admit, the “minted” yogurt garnish is wonderful, adding spring-like freshness – perfect for the last days of winter. If you use a food processor to chop the carrot and onion, this soup will come together in half an hour – and most of that time is sweating and simmering. While the soup bubbles away on the stove, you can put together some grilled cheese sandwiches. Heat the olive oil over medium heat in a heavy bottomed soup pot. Add the onions and carrots, stir to coat with the oil. Cover and sweat for about 10 minutes. Stir every 3 or 4 minutes. Combine the coriander and the toasted caraway in a small bowl and stir. Add half the spices to the carrots and onions along with the garlic and stir over medium heat for a minute. Add the lentils, broth and water to the pot and bring to the boil, skimming off any scum that forms on the surface. Reduce the heat and simmer for 15 minutes or until the lentils are very soft. Now to puree. Mr. Fearnley-Whittingstall would have you transfer the whole pot of soup to a blender or a food processor and puree. I really hope you have an immersion blender, it’s so much easier to dunk it into the pot to smooth out the soup. You don’t need the fancy huge one from Williams-Sonoma. It’s overkill. I got my Braun at Costco 15 years ago and it has several useful attachments. A food mill would also work using the smallest disk, but if you have an immersion blender that would be the easiest by far. 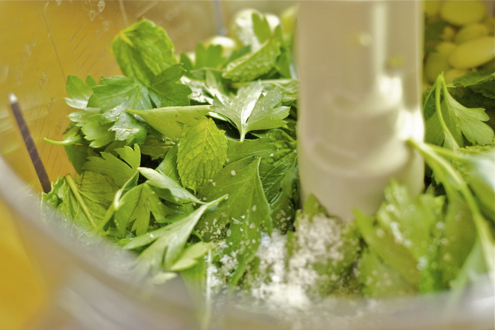 While the soup sits over low heat, stir up the yogurt and mint. Put a little blob into each bowl over the hot soup just as you serve. If you really need to rely on what is at hand and have no fresh mint, just use plain yogurt. I am sure you are wondering if the kids liked this soup. I think it’s just a matter of conditioning. We don’t ever have pureed soups, so they’re not used to the texture. There was nothing off-putting about the taste. Which is to say, no, they did not like it. They all tried it though! And they happily made do with the toasted cheese sandwiches. Nobody cried. I will make this soup again. What should be done with leftover curried roast chicken? I’m still not sure why the answer turned out to be Curried Cubanos. I know, it should have been velvet butter chicken, but we have had a glut of curried chicken in the past few weeks. I was sick of chicken leftovers in quesadillas and chicken salad and even though I love chicken enchiladas, there is way too much prep to build them on a Tuesday night. Considering that the chicken was, in fact, curried, almost anything not Indian would be weird. I was in the mood for a Cubano with Mojo* anyway. Even one with an incongruous Indian accent. Cubanos with Mojo? (I have to say that looks really funny to me. I can’t write about mojo and not think of Austin Powers – even if they aren’t actually pronounced the same way) Anyway, this recipe for pork Cubano sandwiches from Fine Cooking uses a mojo to perk up the flavor. Although I have to say, that the curry from the leftover roast chicken probably contributed more mojo than the actual mojo did. Which is not to say that the curry worked brilliantly – I kept thinking: Curried Cubanos…really?! I don’t know…as I was eating them, not ever being entirely convinced. Still, the kids liked them; we liked them. In terms of whether or not I might make them again, and for whom, well, I might serve them to my sister but never to her husband. I just don’t think he would approve. With the Cubanos we had Black Bean Soup. It has been at least a year since the last time I made Black Bean Soup. I had been following the recipe from Cook’s Illustrated’s The New Best Recipe . I often turn to this book, especially for basic renditions of ethnic foods. They do a pretty good job of transforming supermarket fundamentals into things like pho and pappa al pomodoro which are a lot more fun than macaroni and cheese or broiled chicken breasts as midweek fare. That being said, their black bean soup recipe stinks. Really. Their recipe stopped me from making Black Bean Soup at all. For a while, I couldn’t figure out why it was so terrible. They start with all the right ingredients. First, they cook the beans with a ham hock. Then, adding soffrito with red pepper, garlic and herbs. The weird part is that they finish the soup with this cornstarch slurry, promising to keep the soup nice and black and thickening without pureeing too many of the beans. It doesn’t work at all and there were a lot of extra steps. What I realized when I went back to look at the recipe though, is that they expect the soup to be done in just 2 1/2 hours! And that’s without soaking the beans. No way is that going to work. What I have come to realize is you just can’t rush beans. Not black beans anyway. Thickening the soup with cornstarch is a cheater’s method. Black bean soup should be basic and easy going. It requires nothing more than a little planning. 10-15 minutes worth of work will give you back three days of deliciousness. You don’t want to go messing around with a 3 part recipe to get an inferior soup with a lot of extra work. No. Soak your beans ahead of time and this soup materializes practically out of thin air! I read a bunch of recipes and cobbled this recipe together. This black bean soup is the color of the deepest chocolate. It has a velvety consistency and a gentle, easy, burn. You won’t break a sweat pulling it together. Count on at least 3 hours of simmering though and on soaking the beans. 3 hours before dinner Put the chopped onion, the olive oil and the piece of salt pork in a large enameled cast iron pot or a heavy bottomed soup pot and turn on the heat to low. Put the lid on the pot and cook 12-15 minutes, stirring 2 or 3 times. You don’t want the mixture to get crisp or brown, just to gently soften. Add the beans, the stock and the water and simmer for an hour or so until the beans are soft. 2 hours before dinner Add the tomatoes, cumin, garlic,chili flakes and salt. Leave to very gently simmer for a long long time – about 2 hours. If you put it on a flame tamer and you are feeling brave you can run an errand or pick up the kids from school. This makes me a little nervous but I still do it. I would use a flame tamer though. It would be very sad to scorch this wonderful soup. If you have leftover roast pork in the fridge, use that and you won’t have to make excuses about the curry. Mash salt into the garlic with the back of your chef’s knife or a mortar and pestle. Heat a sandwich press or use a grill pan heated over medium heat. Brush the inside of the rolls with the mojo and mustard. Stack the bottom part with equal amounts of pork, ham cheese and pickles. Place in press or on grill pan. If using grill pan, weight sandwiches with a plate with cans set on top. Flip sandwich when bottom side is browned. Brown each side and let the cheese melt. Since I had leftover chicken anyway, this menu was a breeze. I soaked the beans after dinner the night before and started the soup at about 1:30 pm the following day, when the little guy started his nap. I spent about 15 minutes on it, about 5 of those minutes at 1:30 and 10 at 2:30. I didn’t do anything else with dinner until 5:15. We were eating by 5:45, and that included heating up the panini press. *Mojo: In Cuban cooking mojo applies to any sauce that is made with garlic, olive oil and a citrus juice, traditionally sour orange juice. It is used to marinate roast pork or plantains.